Fabspeed Motorsport elevates the exotic car experience through personalized performance; offering more product options and configurations than any other exotic car tuner, allowing us to custom tailor a sound and performance solution that meets your exact needs and compliments your lifestyle. We are passionate exotic car enthusiasts who eat, sleep, and breath automotive performance and motorsports. From our trained and certified installation technicians and experienced product engineers to our enthusiastic and knowledgeable sales staff - we all love what we do! When you contact Fabspeed, you can be sure you’re talking to the most experienced individuals in the industry. Our employees have years of hands-on experience driving and improving the performance of high-end sports cars and exotics. We have trained professional test drivers and certified high-performance driving instructors on staff who have logged countless hours behind the wheels of high-end supercars, both on the street and on the track. Our backgrounds and extensive hands-on knowledge allows us to better serve you in your pursuit of the ultimate performance and sound from your vehicle! Interested in joining the team? See all of our job openings here. In 1986, owner & founder, Joe Fabiani, purchased his first Porsche - a 1985 911 Carrera Cabriolet - and got involved with SCCA auto-x racing. This lead him to a few stints at Skip Barber racing school and eventually high performance track driving at Road Atlanta, Watkins Glen, Lime Rock, Summit Point, and many more courses. His first dedicated track car, a 1995 993 Carrera, went under the knife for a full RSR Clubsport conversion in 1994. When it came time to choose an exhaust, he was unsatisfied with the selection and quality of the aftermarket exhaust systems available at the time, so he set out to build one for himself. Word quickly spread and his results at the track spoke for themselves. Other Porsche enthusiasts wanted a piece of the action, and so Joe took the plunge and decided to give up his brokerage desk for his own machine shop. Fabspeed was born. Going digital in 2000, Fabspeed's website was one of the very first to produce and host videos highlighting our exhaust systems. Fabspeed’s first dedicated shop in Ambler, PA began refining the sound and performance of Porsche exhaust systems - notably the 993 Turbo and 930 Turbo - but why stop there? A complete exhaust package was developed for the Ferrari 360, the Lamborghini Gallardo, and soon more supercars filled the shop. Within a few years, business was booming. Joe had expanded the Fabspeed product line to include hundreds of different performance products for almost every model of Porsche. Within a few short years, that list would also include applications for Ferrari, Lamborghini, Maserati, Bentley, McLaren, Aston Martin, and more. 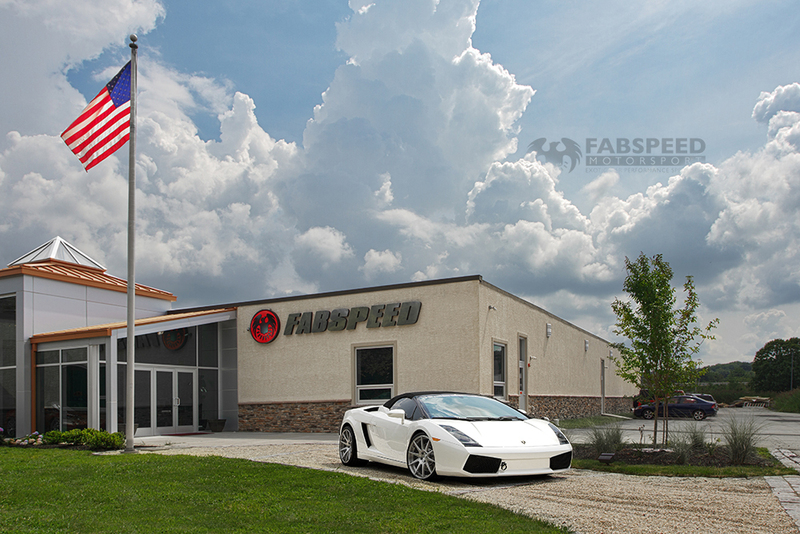 In 2012 we moved into our new 26,000sqft manufacturing facility and showroom in Fort Washington, PA.
Today, with the help of state-of-the-art CNC manufacturing and a team of passionate craftsmen, Fabspeed proudly offers more performance products for exotic cars than any other competitor in the industry. This depth, experience, and passion allows Fabspeed to custom-tailor personalized performance solutions that perfectly complement the lifestyle and goals of every exotic car enthusiast. 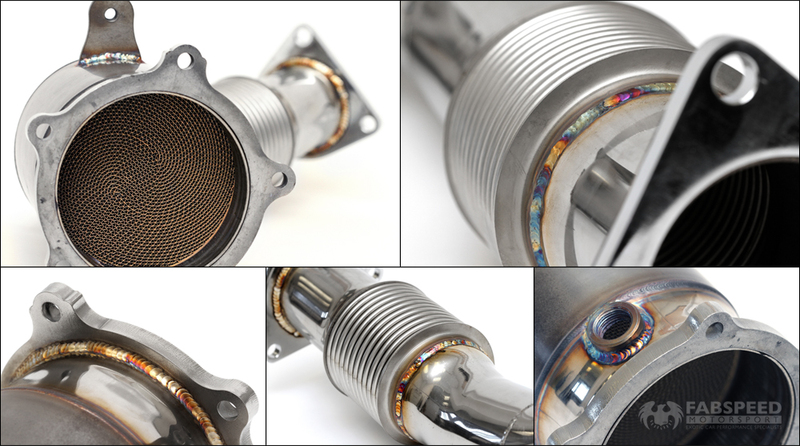 At the very core of Fabspeed’s business is our development and manufacturing division. Our team is comprised of some of the best minds in the business with access to cutting-edge technology and machinery. CNC 5-Axis Waterjet (Flow Mach4 XD) | The Mach 4 Series contains the most advanced waterjet technology in the industry for unmatched versatility and capability; offers a 6′ x 12′ cutting envelope. CNC Mandrel Tubing Bender (Unison Breeze) | Ultra accurate, all-electric mandrel tube bending; compatible with a variety of tubes and pipes including, but not limited to, stainless steel, DOM round steel, and chromoly. CNC Vertical Machining Center (HAAS VF2) |Custom milling, drilling, tapping and more operations. Prototype manufacturing or high-volume production. Specs – XYZ travel: 30″ x 16″ x 20″. Max table weight: 3,000 lbs. Max spindle speed: 8,100 RPM. CNC Turning Center (HAAS ST-20) | Custom turning, boring, tapping and more operations. Prototype manufacturing or high-volume production. Specs – XZ travel: 9.3” x 21”. Max spindle speed: 4,000 RPM. CNC Press Brake (Bystronic XPert – 150 Ton) | CNC-controlled backstops with multiple bending stations allow for high volume and quick turn-around. CNC Plasma Cutter | Cut metals as thin as .030”-.500” with minimal slag and kerf deviations. CNC Laser Engraver | Capable of engraving / marking area within a 7″ x 7″ square or a 10″ diameter circle. 3D Printer (Stratasys Dimension Elite) | Rapid prototyping and product development with a build envelope of 8″ x 8″ x 12″ (203mm x 203mm x 305mm). 3D Digitizing Arm (Romer CMM 7-Axis) | Generate digitized 3D models of existing components for product development and prototyping. All of the fancy machinery on the planet wouldn’t do us any good without our team of highly-talented machinists and fabricators. Our specialists are trained to manipulate metal with all manner of tools and technology. Check out some of our team and equipment in action in our How It’s Made video, which shows the various processes involved in manufacturing our world-famous Porsche Turbo Supersport Exhaust Systems! In 2005, we began recycling 100% of all of our paper, cardboard, metal (incl. catalytic converters) and many other materials to improve the environment. We have cut the usage of paper, cardboard, and other office materials by 80% in the last few years and hope to increase that number in the future. Our goal is to use the least possible amount of paper products in order to reduce energy costs and save trees. Fabspeed’s commitment to being a responsible environmental citizen includes working to ensure that all used and unused materials are properly disposed of at the end of its useful life. Metal recycling is the process of reusing old metal material, mainly aluminum and steel, to make new products. Recycling old metal products uses 95% less energy than manufacturing it from new materials. If we recycle metal products we only have to use 4% of this total energy, which can save our natural resources and reduce our greenhouse gas emissions.